This constant tension caddy is a stylish and practical way to organize all your bathroom essentials, utilizing wasted corner space in your bath or shower. New, patented constant tension technology maintains consistent strong tension at any length of the pole, which extends from 5 to 9 feet and features non-skid feet for sturdy installation. 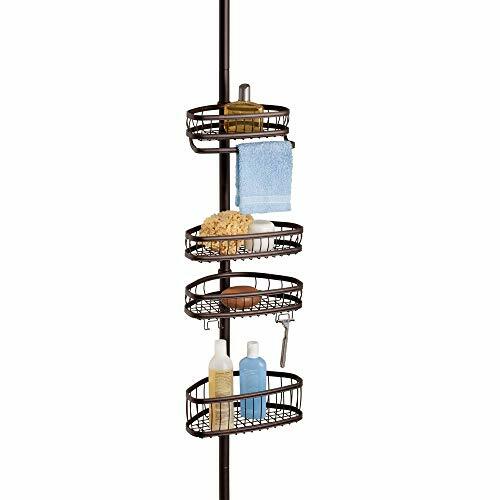 The caddy comprises of a pole with 4 deep wire baskets, with shelves large enough to store your shampoo and conditioner bottles, soaps and lotions, along with a washcloth or towel rack and 2 razor holders. Thermobond coating ensures the bathroom caddy is fully rust resistant, and the open wire design allows it to drain easily, keeping your shower accessories dry between each use. InterDesign’s creative products enhance your décor, turning simple home solutions into must-have accessories that shine. Designed in the USA, we are proud to produce a wide selection of high quality home, bath and storage solutions that excite, inspire and charm. Stylish, functional and affordable, our products have been enriching customers’ homes for over 40 years. InterDesign: innovative products, exceptional value. MAXIMIZE CORNER SPACE: Shower caddy utilizes wasted corner space - pole extends 5 to 9 feet. CONSTANT TENSION: New, patented constant tension technology - strong tension at any pole length. RUST RESISTANT: Steel baskets and stainless steel pole have bronze plating and Thermobond coating.